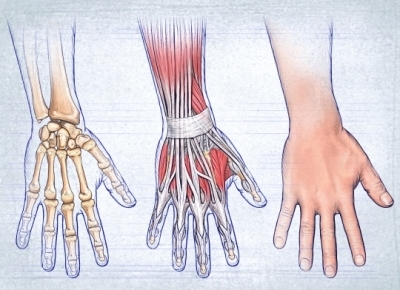 Cubital tunnel syndrome is a set of symptoms caused by abnormal pressure on the ulnar nerve. The ulnar nerve passes through an area on the inside of the elbow, also called the cubital tunnel. Problems with this nerve can cause numbness and weakness in the hand, particularly the pinky and ring fingers. Pressure on the ulnar nerve can cause problems in the pinky and ring fingers of the hand. In some cases, the cause may be unknown. Long-term problems with this nerve can lead to muscle wasting in the hand. You will be asked about your symptoms and medical history. A physical exam will be done. A diagnosis can usually be made based on your symptoms. If an illness or injury is the cause of symptoms, then a specific treatment will be advised for those. Neal SL, Fields KB. Peripheral nerve entrapment and injury in the upper extremity. Am Fam Physician. 2010;81(2):147-155. Trehan SK, Parziale JR. Cubital tunnel syndrome: Diagnosis and management. Med Health R I. 2012;95(11):349-352. Ulnar nerve entrapment at the elbow (cubital tunnel syndrome). Ortho Info—American Academy of Orthopaedic Surgeons website. Available at: http://orthoinfo.aaos.org/topic.cfm?topic=A00069. Updated September 2015. Accessed September 7, 2017. Ulnar nerve entrapment of elbow. EBSCO DynaMed Plus website. Available at: http://www.dynamed.com/topics/dmp~AN~T115940/Ulnar-nerve-entrapment-of-elbow . Updated June 1, 2017. Accessed September 7, 2017.